Working closely with you, we’ll come up with a plan and design for your entire property, or focus on one special space. Your vision for patios, exteriors, gardens and sanctuaries will come to life with practical planning. For bulbs that bloom in the spring, think Tulips and Daffodils, they’ll need to be planted in September or early October, when the ground temperature is 40-50 degrees. That’s typically six weeks before the ground freezes. For bulbs that would bloom in the summer, Dahlias and Gladiolus, you would plant in the spring, after the harsh frost is gone. Whether you have the ideal bulbs in mind or you’d like recommendations that will complement your home, we’ll take into account your garden’s sun exposure and moisture and bring to life your personal retreat. The fence you’ve always wanted. We can clear trees, excavate, or remove stones to install your fence. 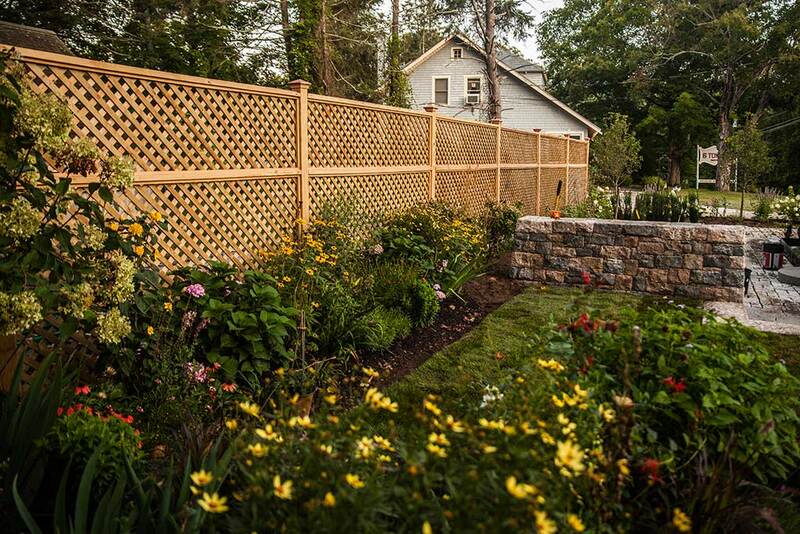 You can customize the design, the materials, and the finishing details of the fence. The perfect time to put up a fence is anytime between March and December, when the ground is no longer frozen. Gain privacy and peace of mind for your loved ones, family, and pets. There are a handful of standard options; stockade, steel tubing, and wrought iron fencing. Of course we love a custom design, see our gallery for more. Bring to light the holiday spirit with home, garden and pathway lighting that comes together for a tasteful yet magical show. We’ll put them up and take them down—get all those hard to reach places, in time for your holiday parties. We can use lights and decorations that you provide or source high-quality, energy saving LED lighting. Built custom to your home, budget, and desired effects, your holiday lighting installation is anything but one-size-fits-all. If you’re in the market for a new lawn, the first step is to evaluate some of the key factors of lawn health. These factors include your property’s soil PH, drainage, sun exposure, air flow, and hydration. From there we’ll decide if we need to bring in healthier soil, thin out a selection of trees, or install irrigation. For instant results we can install farm-grown sod. We can also prepare the soil for seeding, using our landscape rake. We only install the highest quality seed and fertilizer. With the proper care, you’ll start to see your lawn come to life within two weeks. We can up-light trees, illuminate your patio, or line your walking paths and driveway. Landscape lighting can extend your leisure time in the summer and provide safety in the winter. Let us provide you with custom lamp posts made of wood, stone, or metal for your outdoor lighting design. A quintessential element to the New England landscape. Pea Stone is ideal for high traffic areas; walkways, driveways, parking areas, and around the foundation of your home. A softer look than asphalt, pea stone can provide proper drainage and a permeable solution around your buildings and garden beds. Visit our Garden Center for Pea Stone colors and sizes. If we don’t have it in stock, we can order it. Gardens offer an opportunity to highlight the symbiotic relationships of trees, shrubs, and plants. The base of an oak tree can become home to a lush bed of pachysandra that depends on the shade of the tree, which retains moisture and nutrients for the tree’s roots. In the same way, stone can moderate the temperature of the soil, helping plants and shrubs to survive a harsh New England summer. Following your desired landscape plan, trees can be used to accent fences, create additional privacy, frame gardens, and create an aesthetically pleasing and manicured lawn you can be proud of. A great lawn increases your home’s value.